My hunger for books is insatiable right now, perhaps it’s the lazy heat of summer. For the last several days, I can’t get enough time to read. Do you ever feel that way? 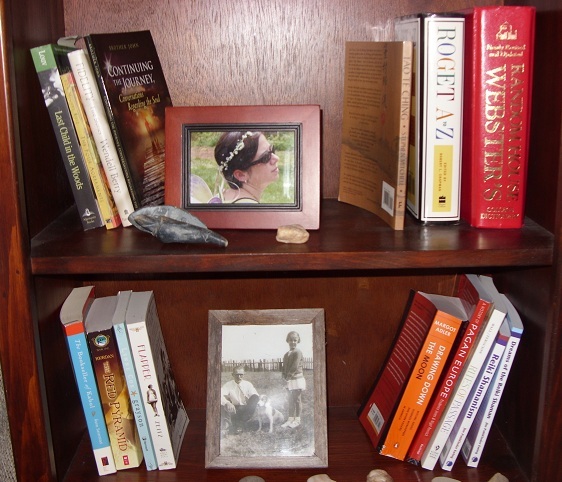 As I type this blog post, there is a beckoning stack of books on my nightstand, another stack calling to me from a bookcase in the living room, & an invisible stack piling up on my Kindle. I won’t venture too deeply in the “paper book versus electronic book” debate but suffice it to say they both have merit. My Kindle is light, easy to carry, & a great way to get any book at a moment’s notice. Paper books will always hold a special place in my heart– the colorful shiny cover, the crisp pages just waiting for me to underline something or make a note in the margin, the smell of newness (or age), & the sound of each page as I fall deeper & deeper in the experience. Fiction or non-fiction, it doesn’t matter. At different times, I need different books. What I read depends on where I’m at with my life & how I’m feeling at any given moment. For example, while I was immersed in my women’s workshop this past spring, I read such titles as Creating Mandalas by RA Johnson, Ancient Mirrors of Womanhood by M Stone, & Wise Talk, Wild Women by G Mazer, works that fed my need to unite creativity & the divine feminine. As I prepared for a spiritual retreat at the Omega Institute, I devoured Soul Retrieval by S. Ingerman & Shamanic Reiki by L Roberts. A rich variety that helped me be a better workshop facilitator & more well-rounded spiritual woman. 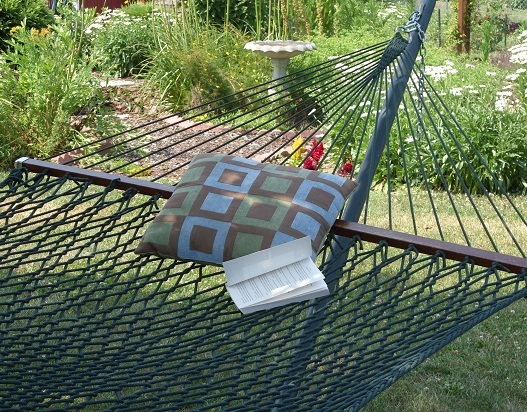 It’s not a purple chair but it’s a wonderful place to read on a summer afternoon. This entry was posted in It's All Connected: Spiritual Musings and tagged books, creativity, human nature, life, reading, relaxation, spirituality, summer, woman, writing by puresusan. Bookmark the permalink. I plan on spending some time in that hammock this summer. It’s waiting for you… any time.